As your customer's sell products, they will enter that on their Buyer's Consignment Inventory. As shown in Figure 1, the Buyer previously sold SJ001 (10 in size 1 and 5 in size 10). You will be able to see the In Stock levels for their Inventory reduced as previously noted in the Consignment Inventory Knowledge Article. Note that you will see the quantities shown that the Consignment customer has sold. See Figure 2. Click the box next to the product identifier. 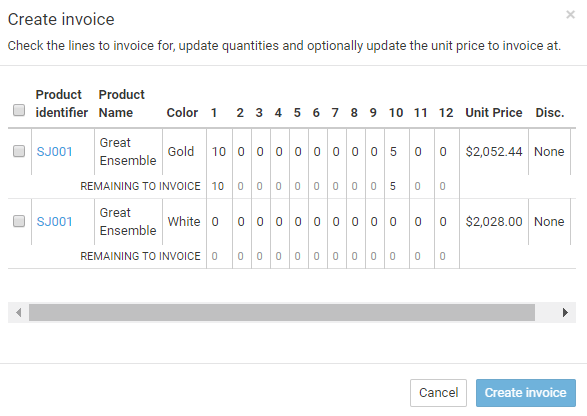 Type the quantity you want to invoice for in the appropriate size field. You do not have to invoice for the full amount sold (e.g. perhaps you had a conversation with the Buyer and they indicated they are expecting a return). Note: Currently, the Consignment invoices are not displayed on the "Invoice" tab for the Buyer. However, these will be added in figure product releases. You (or your Buyer) can create a new Consignment order even when there is still available inventory present for a previous consigned product on a previous order. In this case, as soon as you or your buyer enters and confirms a new sale, Stitchex looks at the previous Sales Order, completes that order first (until SKUs are not available in that order) and creates an Invoice in that order. Next Invoices for future sales will be created for more recent sales orders. In your Sales Order #301, you will NOT see "Remaining to Invoice" quantities. In your Sales Order #263, you WILL see "Remaining to Invoice" quantities. You will continue to invoice against #263 until that Sales Order is complete. Then, any remaining sells will be invoiced against Order #301.